Baked beans and vegetarian sausages in tomato sauce. 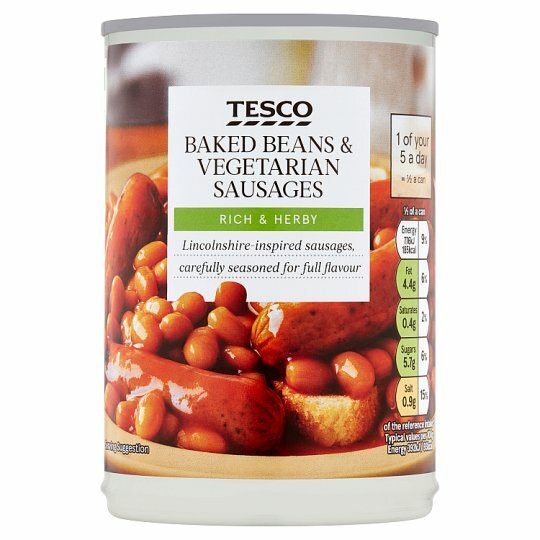 Haricot beans (33%), Vegetarian Sausages (22%) [Water, Egg White, Soya Protein, Rapeseed Oil, Soya Protein Isolate, Onion, Potato Starch, Flavouring, Dextrose, Yeast Extract, Wheat Gluten, Thickener (Methyl Cellulose), Stabiliser (Dicalcium Phosphate), Sage, Thyme, Herb & Spice Extracts [Coriander, Nutmeg, Pimento, Ginger, Sage Extract], Black Pepper, Nutmeg, Salt, Sugar], Tomato Purée, Water, Sugar, Modified Maize Starch, Salt, Onion Powder, Paprika, Paprika Extract, Flavouring. Heat on full power or 2 minutes (800W/900W). Stir, then heat on full power for another 1 minute (800W), 30 seconds (900W). Heat gently for 5 minutes, stirring frequently.